On September 30, Mexicans celebrate the birthday of José María Morelos who is regarded as the national hero and one of the founding fathers of the Mexican nation. Morelos' birthday is a civic holiday, which means that it is observed nationwide, but employees are not given a paid day off. 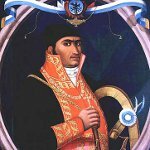 Morelos was born on September 30, 1765 in Valladolid (now Morelia). Through his paternal line, he was related to Miguel Hidalgo y Costilla, another famous Mexican revolutionary leader. Just like Hidalgo, Morelos grew up to become a Roman Catholic priest. On September 16, 1810, Hidalgo sparked the Mexican War of Independence and became the leader of the independence movement. A couple of months later, Hidalgo offered Morelos to join the army. Morelos agreed and quickly showed himself to be an outstanding strategist. In 1811, Hidalgo was captured and executed by the Spanish loyalists. Morelos assumed the leadership of the independence movement and continued the struggle for Mexican independence. In 1813, he organized the Congress of Chilpancingo that declared Mexica's independence from Spain. Unfortunately, Morelos did not live to see the consummation of the independence. He was taken prisoner and executed in December 1815.